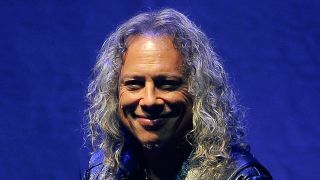 Metallica’s Kirk Hammett says he has a “ton of material” for the band’s next studio album. Bassist Robert Trujillo reported last month that they had been working on new ideas while out on the road. And with Hammett sitting on a number of guitar parts, he tells Mixdown (via Tone Deaf) that he’s "ready to go" on a new record. Hammett reports: “When I was 13 or 14 years old, bands put out albums every year. Seriously, Kiss put out an album every eight months – none of this eight years between albums. He adds: “We’re in our third year since since Hardwired… To Self-Destruct. Maybe we can get a bit more focus and go into the studio a bit sooner. Let’s hope Kirk has all his new material backed up. He famously lost 250 ideas for Hardwired… To Self-Destruct when he lost his phone in 2015.